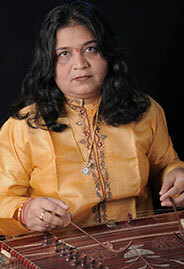 She is the regular "A" grade artiest of santoor by AIR (All India Radio). She is associated to AIR and Doordarshan. Her interviews & performance have been telecast on Sahara Samay T.V. Channel. A number of ragas on Santoor have also been telecast on AIR & Doordarshan.